Ink was first used in ancient Egypt and China. In the 19th century ink wells were manufactured using an amazing variety of shapes - umbrella, boat, tent, barrel, cottage, pyramid etc. They were made of glass or stoneware pottery. The containers were sealed with a cork or sealing wax. 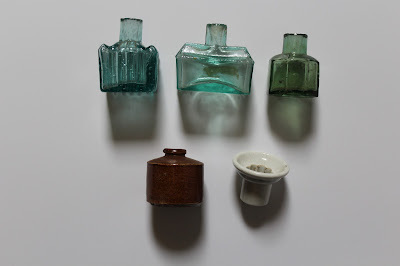 These are some examples from the Museum collection, which are not stamped but probably made in England. The invention of the ball point pen in the 1930s signalled the decline of ink wells.